In this book we distil the vast array of information about weather and climate into some key principles. We will explain daily and seasonal weather events; discuss the drivers of weather and climate; review the longer term complex scientific models that measure and monitor our variable climate and describe how to manage the risks that weather and climate present to your business. 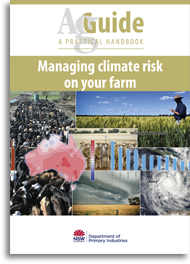 Published in 2017, Managing climate risk on your farm is part of the AgGuide Series and is 90 full-colour A4 pages.